Explanation: Centered in a well-composed celestial still life, pretty, blue vdB 9 is the 9th object in Sidney van den Bergh’s 1966 catalog of reflection nebulae. It shares this telescopic field of view, about twice the size of a full moon on the sky, with stars and dark, obscuring dust clouds in the northerly constellation Cassiopeia. 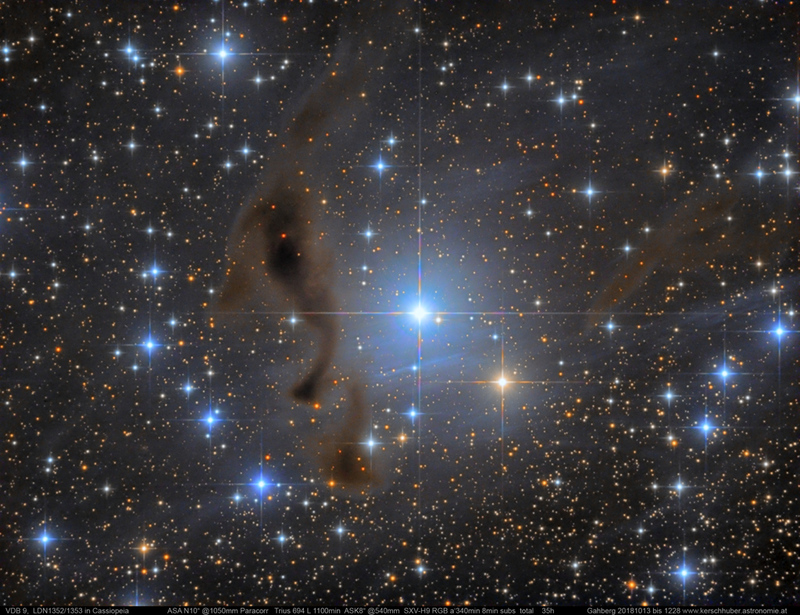 Cosmic dust is preferentially reflecting blue starlight from embedded, hot star SU Cassiopeiae, giving vdB 9 the characteristic bluish tint associated with a classical reflection nebula. SU Cas is a Cepheid variable star, though even at its brightest it is just too faint to be seen with the unaided eye. Still Cepheids play an important role in determining distances in our galaxy and beyond. At the star’s well-known distance of 1,540 light-years, this cosmic canvas would be about 24 light-years across.